When I started as a young reporter at my first newspaper job in Illinois, I was assigned to cover a half dozen small farm towns. I didn’t think much would happen out there. I confess: I love anecdotes. These are basically when a writer shares a mini-story about a real-life moment or experience. Usually, they are plucked out of the past, and presented without much introduction. Their power is that they draw you into a story, or college application essay, by starting with a punch of drama. The key is to get as close to the action as possible. I’ve written tips and advice on how to write anecdotes, but thought I would try to model an example. They seem so simple when you read them, but they are harder than you might think to craft. The trick is to practice, and study how other anecdotes are put together. When you write a college application essay, you want to “grab” the attention of your reader from the start. My favorite writing technique to hook readers is to engage them with an anecdote, which is a real-life moment or incident. You might have already written your essay, and not noticed that you have one of these magical anecdotes down low. Actually, if you start almost any type of writing with an anecdote–from a college essay to a book report to a press release–your message will instantly rise and shine above other written messages competing for readers’ attention. Most students have never written narrative essays, which are so different from most essays taught in English classes. The classic 5-paragraph essay has a formal style, uses the third person, includes a main point or thesis statement in the introduction and has three supporting body paragraphs. These college application (narrative) essays are the opposite. The style is more casual, the structure looser and no one is counting the number of paragraphs. They are told in the first-person and the main point is usually not stated directly, but implied by the essay itself. However, there seems to be confusion between whether these narrative essays are the same as stories, or if they just contain mini-stories from real life. In general, they only contain small pieces of stories, called anecdotes. These are used in the introductions because they grab the reader’s attention with a compelling description of an interesting moment or experience. However, the entire essay is not one complete story that starts at the beginning and runs through the entire piece until the end. Writers start with an anecdote to engage the reader by describing a moment, which tries to illustrate a larger point in their essay. The rest of the essay is used to explain the broader meaning of the anecdote. I know it can be confusing. But I think people who resist the idea of narrative-style writing in these essays don’t understand the difference, and think narrative means the essay relates one long story. It doesn’t. The narrative, or story-like style that reads like fiction, is mainly used only in the beginning of these essays. (In news or magazine stories, they are called anecdotal ledes.) The rest then shifts into a more explanatory mode. So you do not want to tell one long story in your essay. But you do want to look for mini-stories, or moments, or “times,” that you can relate as examples of something you want to illuminate in your essay. 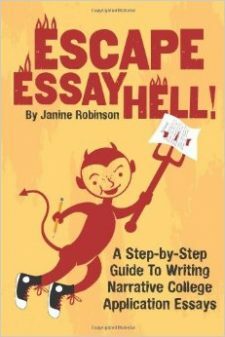 In my new ebook, Escape Essay Hell!, I explain how you can use a Show and Tell structure to write a compelling narrative essay about yourself. The first part, using an anecdote, is the Show part. The second part, where you explain what the moment or experience meant, how you thought and felt about it, and what you learned, is the Tell part. Find examples of narrative writing in college application essay in my favorite collections of sample essays.